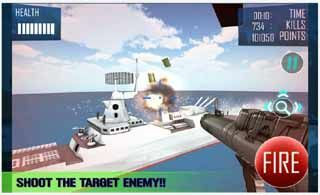 Free download latest version Navy Gunship Shooting for Android with APK file. Navy Seals! Are you ready for a real attack on a navy ship that is detected in deep sea by our satellite. As per the visual signals received the carrier doesn’t have any flag nor have any kind of symbol which represent it as an opponent. In an ARMY Base, The Commodores and high officials military staff have decided in the meeting that we would first check the ship carrier; if some one resist we will take it by force. Currently the Navy Ship carrier is sailing in deep seas location S83’16.8″ E23’74.0′ at top speed of 20 knots. Go check the ship existence. Time is short, Go make a strategy and eliminate the resistance. Your mission code is “Red Water”. Touch & Drag the screen anywhere to move/rotate your gun left, right, up or down. Aim and tap Fire button at bottom right to fire. For clear aim view use the Telescope for sniper target shot. Try to shoot and kill enemy soldiers on first spot. The weapons will reload itself and you have unlimited number of bullets. FPS (First Person Shooter) Game. Excellent real look 3D environment.